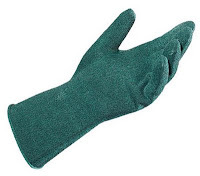 I’m pleased to introduce a new glove to our line of High-Visibility gloves. After all, daylight savings time will end this week so it comes at a very appropriate time and better yet it’s a “lined” fall/winter version. Why all the fuss about this type of traditional type of leather palm glove? First, it is a full-featured high quality grain pigskin leather with all of the features only found in more expensive models. See the new MCR Safety Hi-Vis Orange Lined Pigskin Leather Palm Glove. 1. Quality select grain pigskin which dries soft and remains supple if they get wet unlike cowhide. 2. Hi Visiblity Orange/Yellow bands on the back of hand. 3. Retro-reflective strips built into the hi-vis bands. 4. Insulated lining for warmth. 5. Reinforced finger tips for added protection. 6. 2.5” Safety Cuff for easy on and off. Lastly and most important, this model is a whopping 30% less in savings than the other alternate model which we have been selling for years – and without sacrificing on quality or design. The pricing on this glove is awesome. I had some fun talking about my glove friend, Doug Little, last week but MCR Safety has really thrown down the Gauntlet last year when they introduced their HexArmor Cut Resistant Gloves. Our 5th Century ancestors were very industrious and safety minded when they developed armored metal gauntlets (gloves) for combat (pictured). These gloves were not only cut resistant but puncture resistant. To my knowledge, no glove has ever equaled those medieval gloves. That is until MCR Safety created their own glove renaissance with the creation of their HexArmor line of gloves. The HexArmor gloves are not only cut and puncture resistant but one model is even needle stick resistant, too. And my friend, Doug, will back me up on those claims. After all, he’s living proof. You can check the HexArmor Glove Line out at my company’s web site and you can also see a “LIVE & UNCUT” video demonstration. What do you think MCR will come up with next in a glove? I had the rare pleasure of meeting another Glove Guru while attending the National Safety Council Conference last September. I liken my new glove friend to a human cannonball since here was this modest, intelligent looking guy right in the middle of the sprawling Anaheim Convention Center surrounded by thousands of dubious safety engineers subjecting his (gloved) hands to literal torture. Imagine a person jumping onto a bed of nail spikes and you get the picture. It was frightening to watch his bravery and the steadfast confidence he held in the gloves he wore. Meet Doug Little, Innovations Manager, for MCR Safety. (Pictured) Doug is one of the brains behind an extraordinary new line of MCR gloves called HexArmor Gloves. During his presentation, Doug was using all types of evil looking props to demonstrate these new cut and puncture resistant wonder gloves. Nasty sharp things like razor knifes, razor wire (think prison fence), barbed wire, hypodermic needles, nail spikes, the list goes on. If you want to see a much tamed down version of Doug’s glove presentation, click on this You Tube link. I’ll be talking more about these new wonder gloves in a few days but I bet if P.T. Barnum was still alive, MCR Safety might be looking for a new glove guru and human cannonball. By the way, you get one guess to know if I tried to buy and monopolize all of MCR’s stock of HexArmor Gloves. In this world of on-line dating, finding the perfect pair of gloves for safety, work or play is becoming easier than ever. Finally, high tech gloves are meeting its match in social marketing. Surely you’ve heard of YouTube, et al. Two of our strategic partners are now utilizing video streams to show how their gloves perform. It sure saves time, e-mails, and gas to reach customers needing a quick hand protection solution. Not only do these streams help us demonstrate the gloves, they also help customers make a suitable choice. See the MAPPA Kronit Gloves in action. See the MCR Safety HexArmor Gloves in action This link is not for the faint of heart. I sure wish this technology existed when I was pounding the pavement. What do you think about this concept?